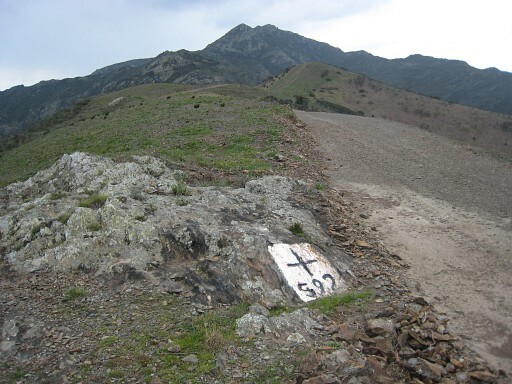 From Col de Banyuls (bm591) along the borderridge on (yellow) waymarked trails to bm601. 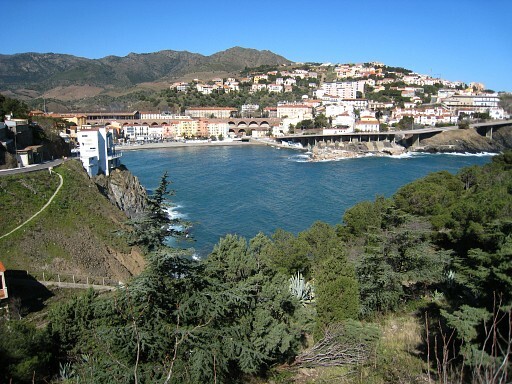 Then descending along the coastline to Cerbère. Splendid views of the valleys and the sea. Quite strenuous in its going up and down. Be aware: water is scarce and not available at the starting point. If you prefer to split this stage, you might bivouac near bm 596: there's a source (Font de Tarabaus), a few minutes downhill in Spain. 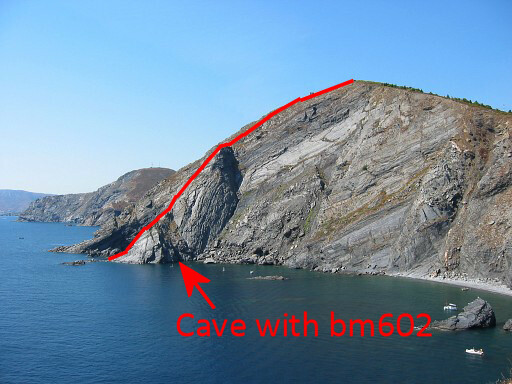 At bm601, the trail descends to Cerbère because that allows a view of the northern entrance of the cave with bm602. 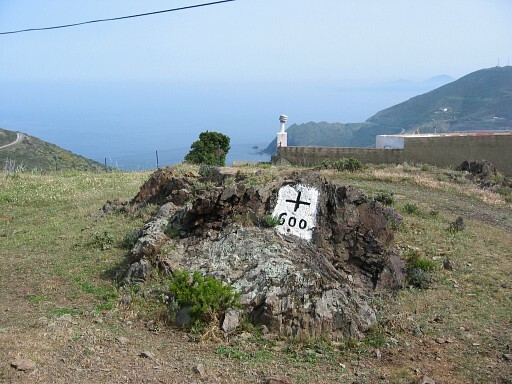 There's also a trail - from bm601 - descending to Portbou, which was tricky in some parts in 2008. - km & elevations according to Basecamp. You might check the relevant webpages in the 'All markers'-section and 'All my trips'-section. 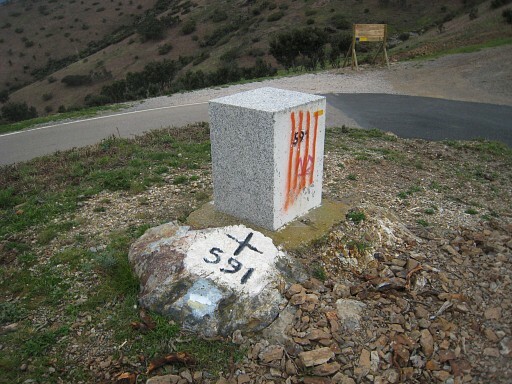 They provide pictures of the bordermarkers and additional information. 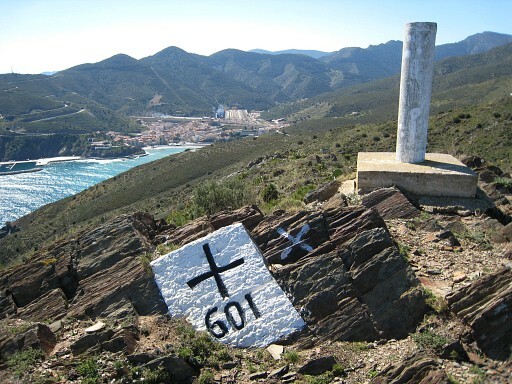 From Coll de Banyuls follow the trail SSE along the double bm591. It merges with a dirtroad on the left side of the ridge. 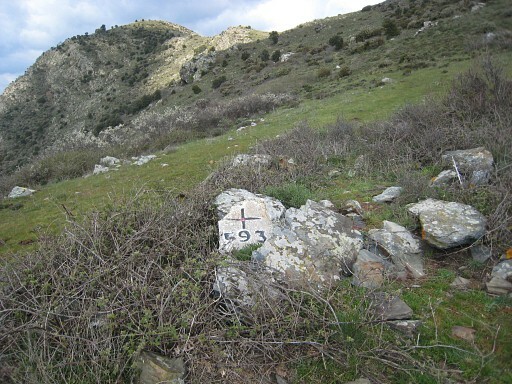 Bm592 (a cross) is at your left, a few meters further. At the end of the dirtroad, climb to the ridge. 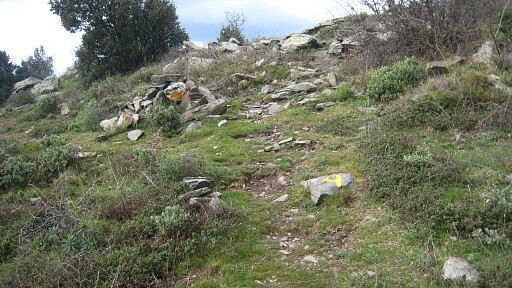 That's where a trail starts and climbs on the rocky Spanish hillside. A bifurcation at this point (picture below). Go straigh ahead and climb the Pic de la Calma. 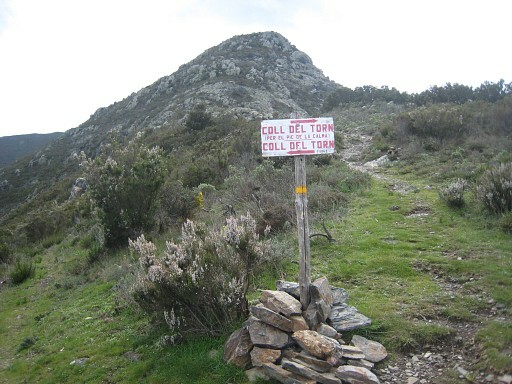 I didn't check the left route to Coll del Torn. 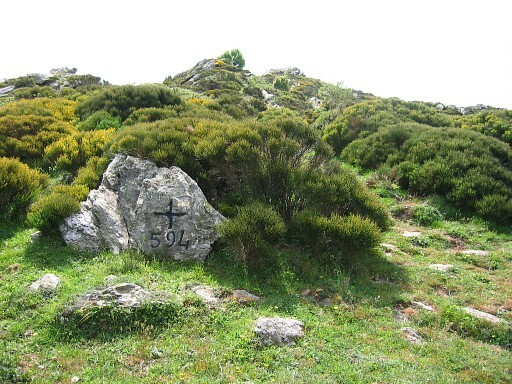 After Pic de la Calma, you'll arrive at Coll del Torn, the location of bm593 (a cross) which lies flat on the ground, a bit hidden by bushes. Further on, another biforc, don't miss this one. 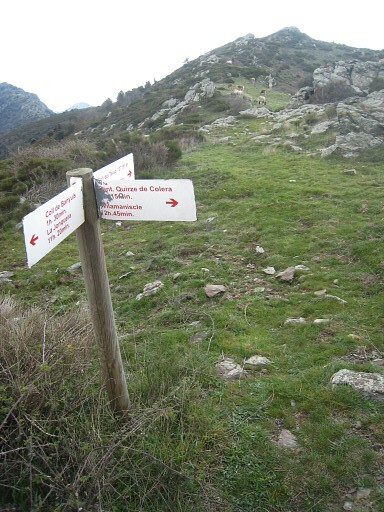 You have to go LEFT here to proceed to Coll del Teixo. Going straight ahead will lead you into Spain. 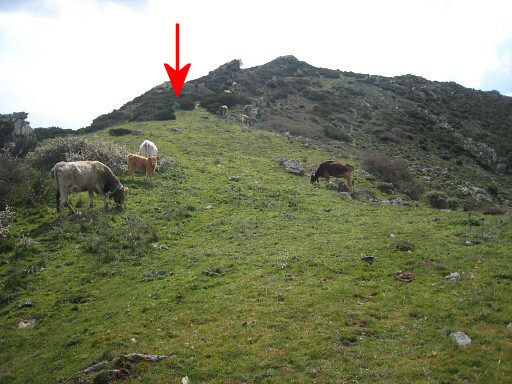 At Coll del Teixo (this picture), bm594 (a cross) is located at the far SW-end of the pass. Proceed to bm595 (double: pillar & cross). Further on, the trail enters a forest on the French side. It goes underneath the borderridge to the next pass, Col de Tarabaus. 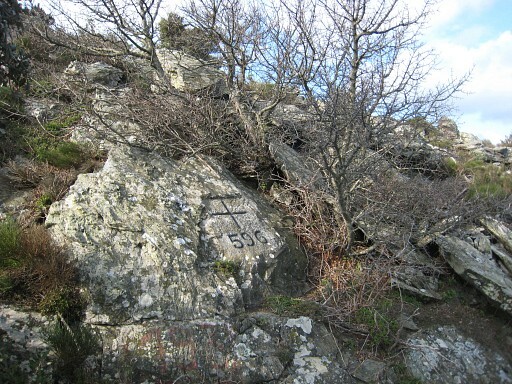 Bm596 (a cross) is on the west-side of that pass, against the rocky side. There's a source (Font de Tarabaus), a few minutes downhill in Spain. 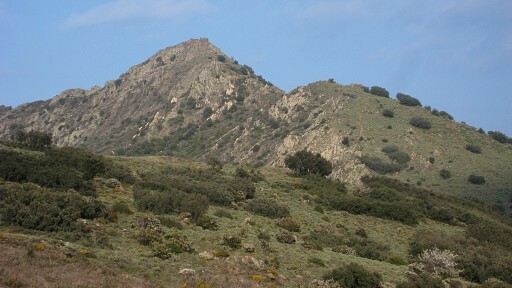 The hilltop of Torre de Querroig already in view. 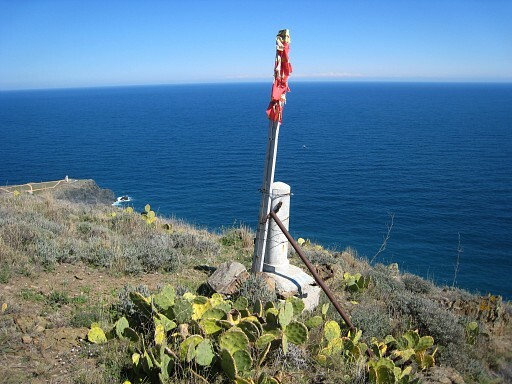 You don't need to climb the top, our trail goes underneath it at the Spanish side. But first you'll reach Col de Rumpissa (the next pass on the picture above). 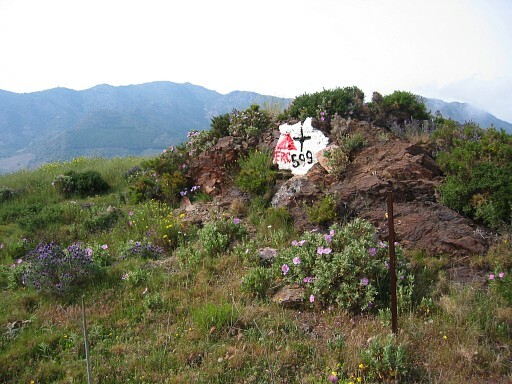 You can't miss bm597 (a cross) at its NE-side. 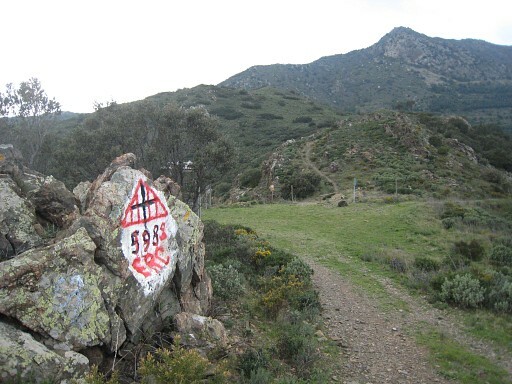 After Torre de Querroig, the trail descends to Col de la Fareille with bm598 (a cross) at its eastside, along the dirtroad. 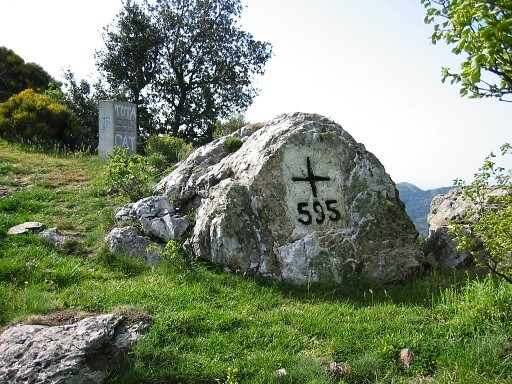 Proceed to Coll del Frare where bm598 (a cross) is located at its eastern side. 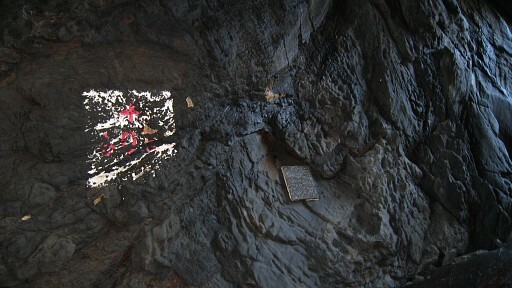 This cross was found severely damaged in 2011 and a plaque was attached in 2013. Follow the dirtroad on the French side, going underneath the hilltop and reaching the ridge again. Leave the dirtroad at its last bend and descend on a trail along the ridge. You'll find bm599 on a small rocky outcrop, ±20 meters from a house. At the col, go 30 meters to the left and enter the dirtroad, going east. After 50 meters, take the branch right. That will bring you further on back to the dirtroad. 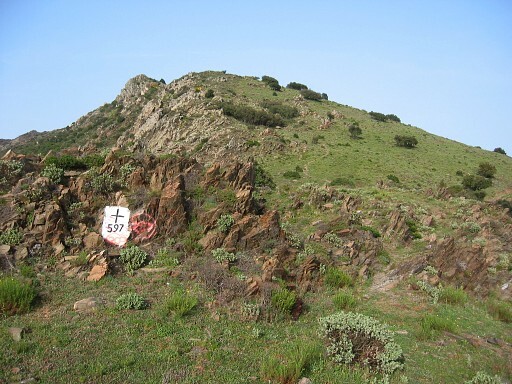 From there, take the trail over the ridge, leading you to bm601 (a cross) besides a geodetic pillar. 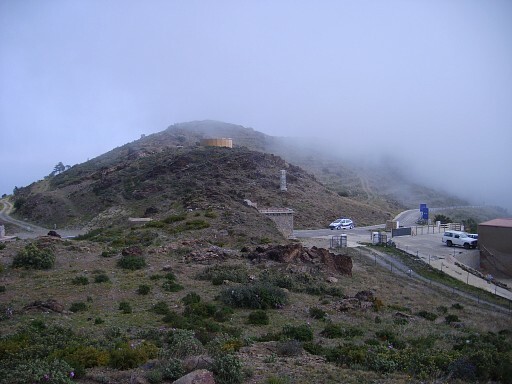 When making a short loop from bm601 - descending ±75m SE - you can visit bm601bis. That's a simple concrete pillar, 20 meters east of a giant billboard. You might wonder if it's possible to walk to bm602 in that sealevel cave-tunnel, the Cova Forada. 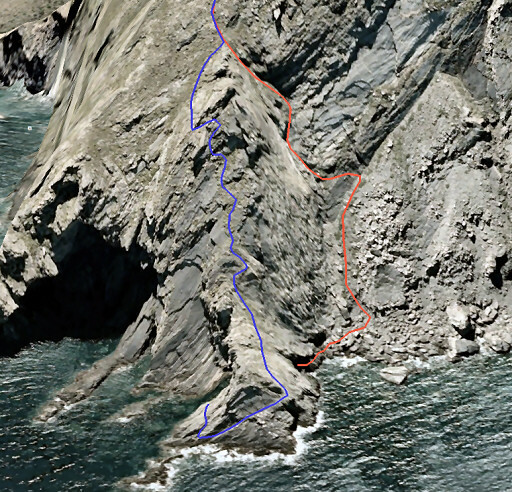 From bm6101, the main route now descends along a trail to the north, along the steep cliff-side to a parking-lot. 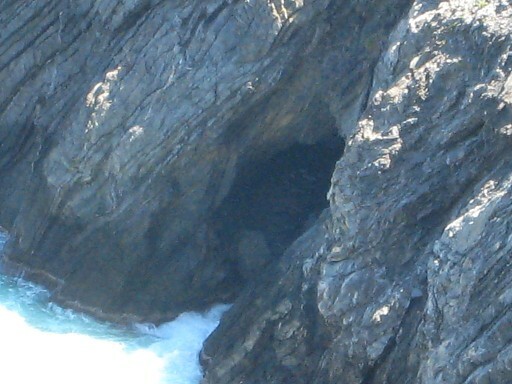 From the cliff-side, you can spot the nothern entrance of the cave with bm602 . Then, just follow the road to Cerbère. If this is your final stage of the GRPdesBF, you're about to complete an astonishing tour de force, something to be proud of forever. Whether or not you did the whole trail, I hope you enjoyed it. 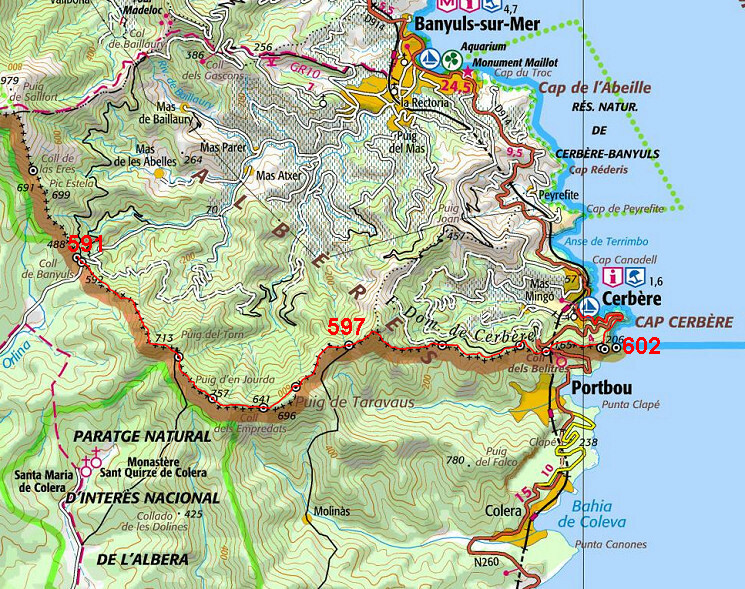 And understand why searching the pyrenean bordermarkers has touched my soul.